Who doesn’t love breakfast burritos? But not everyone has time in the morning to stop at a fast food restaurant to pick one up or to spend the time making one before leaving for work. That’s why the Hamilton Beach Breakfast Burrito Maker is so awesome! You can have your breakfast burrito ready to eat in 5 minutes! You can use fresh ingredients at home and save some money rather than spending money to purchase a breakfast burrito. 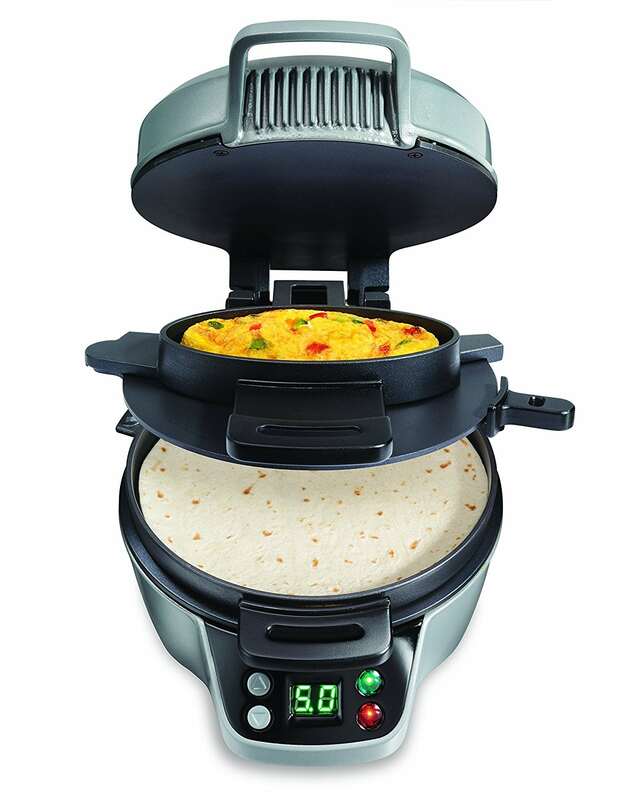 It features a timer so you can set the Breakfast Burrito Maker to cook for however long you need and it will ding once your delicious food is ready. This amazing device can make more than breakfast burritos! It can also make stuffed pancakes, omelets, personal pizzas, and more. So if you’re not in the mood for a burrito, you have quite a few options to choose from and the Breakfast Burrito Maker even comes with a little recipe book to give you some ideas. It’s important to note that you do need to use precooked meats if you want a recipe with meat in it. The Breakfast Burrito Maker makes breakfast easy! Even the clean up is easy. The removable parts of the maker are nonstick and top-rack dishwasher safe.